On the 1st day of Christmas Welty gave to me, a Topping Out Ceremony. Welty celebrated this milestone at Woodridge school with the students, Woodridge leaders and the Welty construction team. The Junior Core students signed a steel beam that was raised into place, along with a Christmas tree for the holiday season. 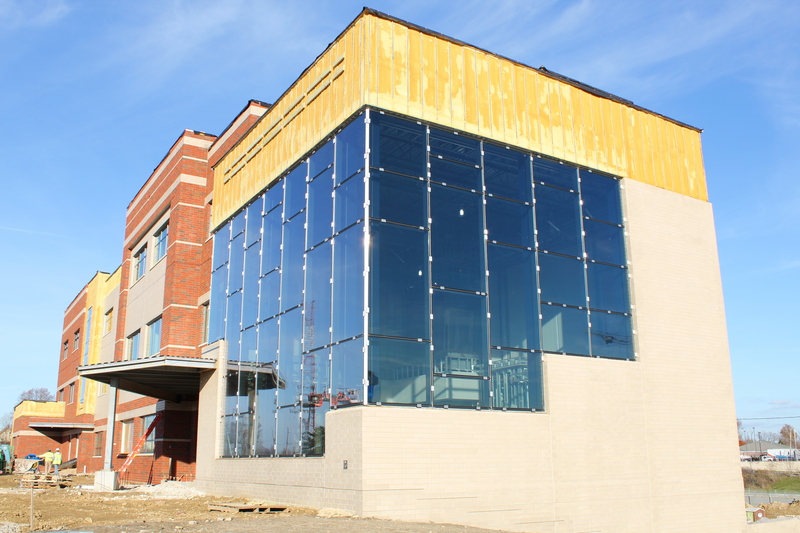 This new facility will combine two existing elementary schools into one. Approximately 900 students, grades K-5, will learn in the new 132,858 SF, 2-story facility that includes a main gym, auxiliary gym, library, cafeteria, and multiple classrooms with advanced capabilities. On the 2nd day of Christmas Welty gave to me, 2 checks to make children happy while they get well at Akron Children’s. 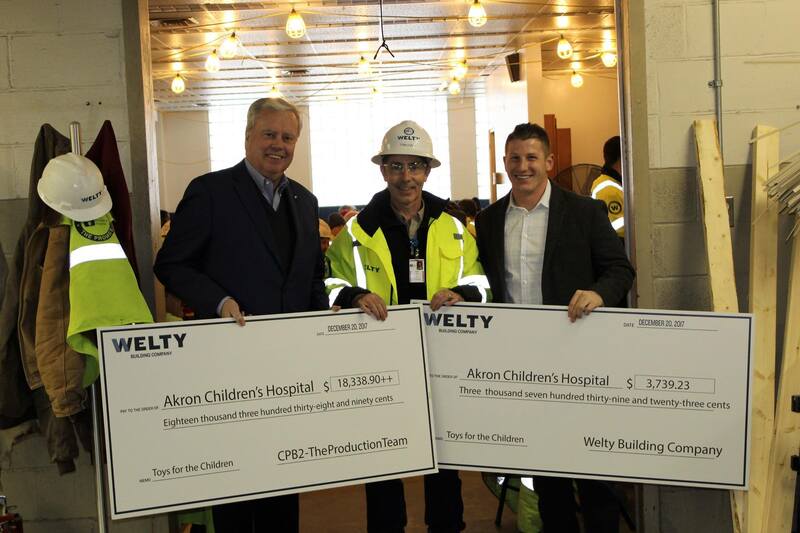 On December 22, Welty presented two checks totaling over $22,000 to Bill Considine in support of buying gifts for the children of Akron Children’s Hospital. The money was raised in just two months from Welty project scrap waste along with cash donations from employees. The construction team at Akron Children’s Hospital recycled over $18,000 worth of assorted scrap metals from the Considine Professional Building addition. This was achieved through our staff working at the project along with our subcontractors; JW Didado Electric, Forest City Consulting, United Glass and Panel Systems, Gorman-Lavelle Corp, and Th Martin. The original goal was to raise $750 by December 15. The donation ceremony included over 36 sheets of pizza to feed 160 workers from the Akron Children’s job site, and heartfelt words from Bill Considine thanking everyone for their efforts and wishing everyone a happy holiday. Scrap metal is still being collected from current job sites including $3,000+ raised from the Cleveland Athletic Club and the East End Akron. We wouldn’t be able to achieve these great results without the help of a few of our subcontractors; Kenny Constructions Pty Ltd, The Obayashi Corporation, Einheit Electric Construction Co., JW Didado, and S.A. Comunale. We would like to take this opportunity to thank City Scrap & Salvage, our subcontractors and employees within Welty for their effort in collecting this scrap, cashing it in and creating the chance to be able to give back to children within our community. On the 3rd day of Christmas Welty gave to me, 3 reasons to call WFSG. 1. Help control overall building operating and maintenance costs. 2. Improve the condition of the facility. 3. Provide preventative maintenance and operations of the building and its systems. If you need help repairing or maintaining your building call WFSG 234.678.1121 and have one less stress this holiday season. On the 4th day of Christmas Welty gave to me, 4 amazing projects from e4b. Environments 4 Business LLC has extensive experience in all vertical markets of the contract furniture industry which includes corporate, healthcare, education, hospitality, and government. On the 5th day of Christmas Welty gave to me, 5 golden LEEDs. 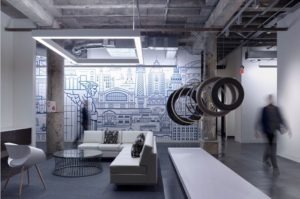 Welty has been involved with LEED certified projects since 2002 and has been a successful participant in obtaining certification on every project requesting LEED certification. We have a proven history of exceeding LEED goals without passing additional cost to the owner. These results were achieved at the Goodyear World Headquarters, where LEED Silver was pursued and LEED Gold was obtained. 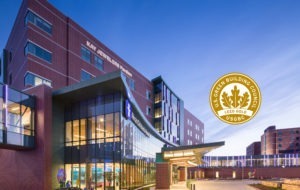 These same results were attained at Kay’s Pavilion Outpatient Surgery Center Akron Children’s Hospital, The Timken Company’s New Bearing Headquarters, andFirst Energy’s West Akron Campus. 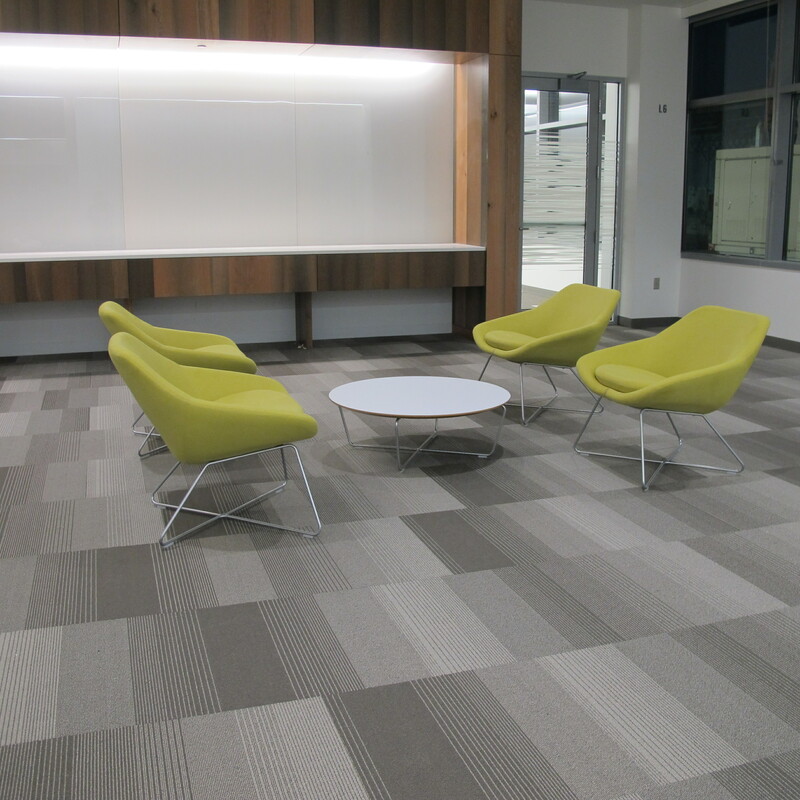 Welty also achieved LEED gold for the showroom buildout at Environments 4 Business LLC. 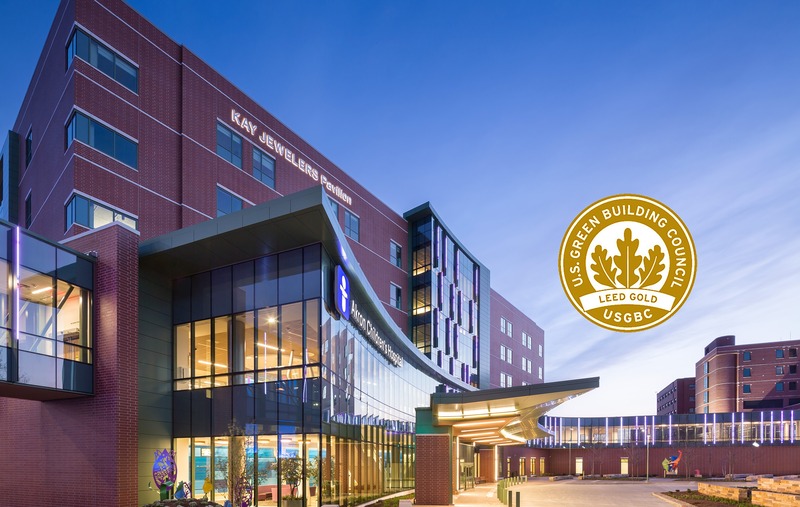 Read the full story about our LEED Award at Akron Children’s Hospital. On the 6th day of Christmas Welty gave to me, 6 mobile apps to improve job site safety. Visit our blog to get all the details and instructions on how to download. On the 7th day of Christmas Welty gave to me, a 7-story atrium in the lobby. Welty has been a part of Akron’s redevelopment initiative for the Offices at the East End Akron. 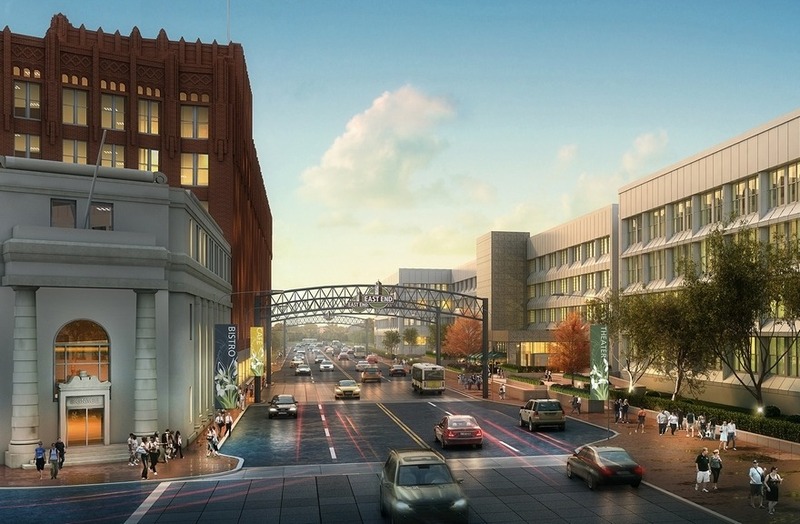 This historic redevelopment of the old Goodyear campus in downtown Akron creates a 1.6 million SF mixed-use space that will include high-end apartments, restaurants, retail and office space. 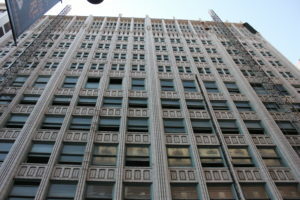 The new offices will receive a complete upgrade in the infrastructure, including roofing, windows and elevators. In the lobby will be a 7-story atrium, as well as a restaurant that will include a terrace for outdoor dining. The space will also include a 5,000 SF fitness area. For more information on The Office at the East End, visit our project page. On the 8th day of Christmas Welty gave to me, 8 special features at the Dealer Tire facility. For more information on Dealer Tire, visit our project page. On the 9th day of Christmas Welty gave to me, 9 completed sites dug for the OCIT by Rosie. Welty, in partnership with Parsons, is serving as Construction Manager on the City of Akron’s Ohio Canal Interceptor Tunnel (OCIT) project. 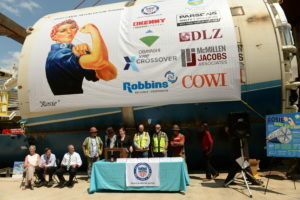 The tunnel will serve as the new sewer system for the City of Akron, collecting up to 25.6 million gallons of sewage and stormwater during heavy rain events. The tunnel, which will span 6,240 feet, is dug by a 325-foot tunnel boring machine nicknamed Rosie. OCIT will help to improve and maintain water quality in the Cuyahoga River. To follow along with the progress, to take a tour, or for more information go to Akron Waterways Renewed. For more information on Ohio Canal Interceptor Tunnel, visit our project page. On the 10th day of Christmas Welty gave to me, one hundred and 10 years between the founding and the restoration of the CAC. The Cleveland Athletic Club (CAC) is a historic organization headquartered in a historic building designed by J. Milton. 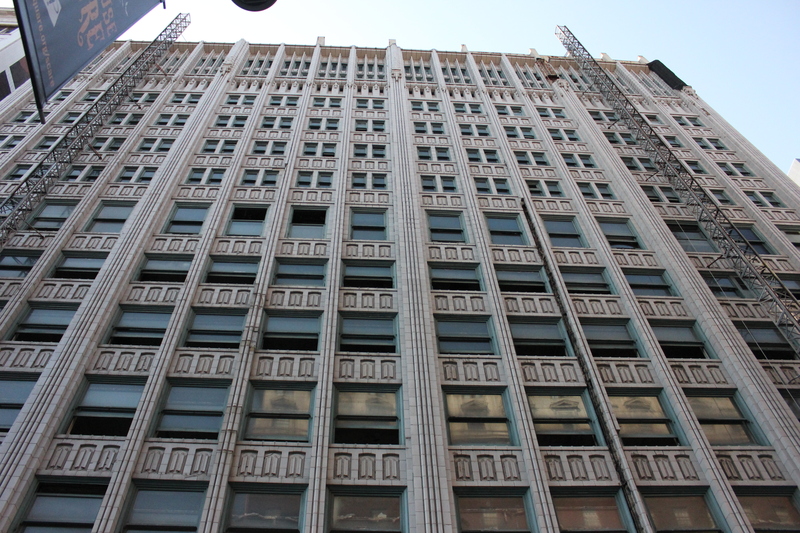 The CAC Building was built in 1911, standing 177 feet tall and 15 stories high. 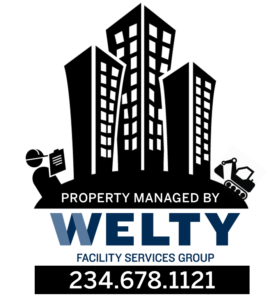 CAC was founded in 1908, and now in 2018, Welty is providing preconstruction services to give the building a major makeover. The project includes a 195-room hotel, apartments, retail, restaurant space and parking. 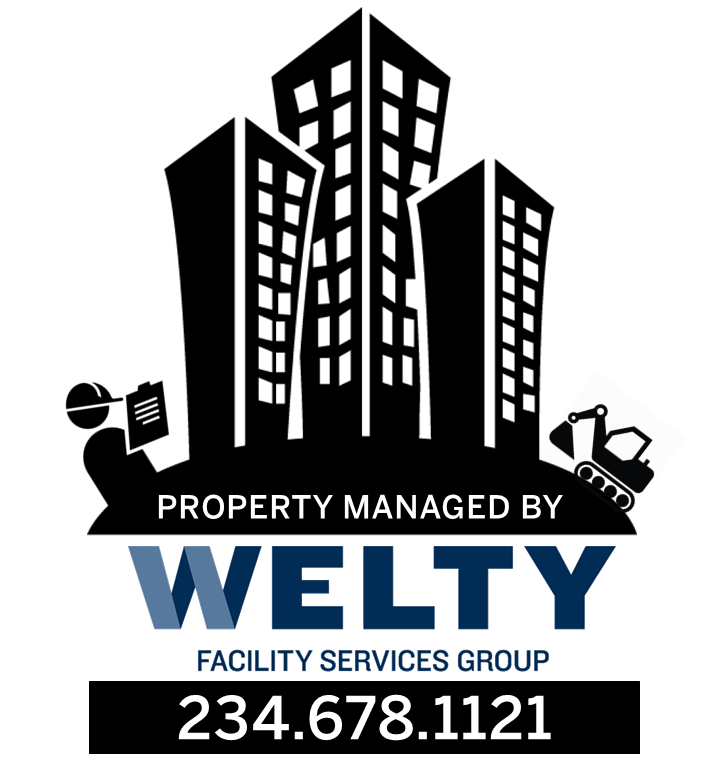 On the 11th day of Christmas Welty gave to me, construction on 11 acres of property. The Stark State College Akron campus is well underway. The state-of-the-art facility provides plentiful, proximate parking; a convenient downtown location right off of Route 8 for students from anywhere in Summit and the region; and Metro public transportation access. The new 65,209 square foot, three-story building will house classrooms and administrative space. It will also feature a market area and digital library. For more information on Stark State College, visit our project page. On the 12th day of Christmas Welty gave to me, under 12 months for completion of the View on Pavey. The View on Pavey Square will include 132 apartments — containing a mix of studios, one-bedroom, two-bedroom, three-bedroom and four-bedroom units — plus 6,587 square feet of retail and office space. A total of 253 parking spaces will also be accommodated with structured parking in the new building.